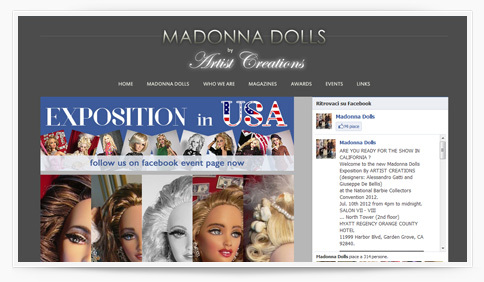 Italian One Of A Kind Fashion Dolls. Alessandro Gatti & Giuseppe De Bellis of “Artist Creations” from Rome (Italy) are two young set decoration and costume designers, brains and muscles of the consolidated team specialized in Italian OOAK dolls, now one of their unmistakable trademark. The guys of “Artist Creations” utilize their background as set decoration and costume designers for theatre, cinema and television. After graduating from the School of Arts, and Fashion and Costume School, they specialized in various professional courses concerning their field. This magnificent hobby conciliates nicely with their profession in the word of show business, in the movie town of Federico Fellini, Rome, the celebrated location of many great American movies from Ben Hur to Cleopatra. Both their hobby and profession are made up of important contacts and renowned collaborations that inspire and characterize their style.